The 48-year-old's death, confirmed by her publicist, came on the eve of the Grammy's - the LA gala of music's biggest occasion - and the event is likely to become a tribute to the troubled star. Houston, herself a Grammy award-winner, was found in her hotel room on the fourth floor of the Beverly Hilton late yesterday. Los Angeles police said paramedics unsuccessfully tried to resuscitate the troubled singer, who had battled with drug addiction, and she was pronounced dead at 3.55pm local time. Police said there were no "obvious signs" of any criminal intent in relation to Houston's death. Houston, who some speculated was on the brink of bankruptcy, was pictured last week looking dishevelled and disorientated as she left a Hollywood nightclub with her daughter Bobbi Kristina after performing at a pre-Grammy party. She had previously attended rehearsals for the Grammys, coaching singers Brandy and Monica, and it is believed she was due to perform at the annual pre-Grammy party of her long-time mentor, record producer Clive Davis, at the Beverly Hilton, but was found hours before it began. The party went ahead despite her death. Organisers of the awards have said Houston will be remembered in a tribute by Jennifer Hudson. Houston won multiple Grammys including album and record of the year, selling millions of albums and singles worldwide. 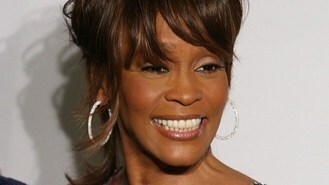 The I Will Always Love You singer also carried her success into the film industry, appearing in hit movies including The Bodyguard. But her career began to unravel as she battled with drug addiction, spending various spells in rehab. Her voice began to suffer, prompting record sales to nosedive and in 2007 her 15-year marriage to husband Bobby Brown came to an end.